As a child, as a very young child, I struggled in many ways, but mostly academically. By grade four I was labeled and placed in a class for special needs children. My classmates that year were among the most disadvantaged and challenged of children, those you would call severely handicapped, or retarded. It was not taken in to account that I had hurdles and obstacles to overcome that your average child did not, like not speaking until I was almost six because I had a tube in my throat. No, I don’t think I was ever slow, or mentally handicapped, like I was labeled over the years, I think I was late out of the gate. I was playing catch up from day one. Why am I telling you all this? Simple, I am telling you this to tell you why we should foster in children the belief that they can become whatever they want. I am telling you this because I think you should know what happens when the opposite is instilled in a child. I was told from a very young age all the things I would never be. I would never be an oceanographer, I would never be a paleontologist, I would never be anything that required an education. That’s right I would never be a Writer either. Teachers, family members, friends, everyone was so damn sure I would never amount to anything. Thing is, as a child I began to believe this garbage. I was returned to mainstream education in grade five. The Special-Ed teacher, (Mr. Cooper) was perhaps the first adult to show any faith in my ability. He recognized that I did not belong in his class. Unfortunately the damage had been done. I never saw the point of getting an education. Future teachers continued to doubt my abilities and not expect very much from me. I dropped out of school. I never became any of the things I could have been. As much as I accept the blame, there is also a finger to be pointed at all those people that applied labels and crushed those early dreams. All those people who called me stupid, made fun of my slow speech and my deep voice, all those people that said I couldn’t, I’m here to tell you I can and I could have probably done it sooner if I didn’t believe you. You see that’s the problem, if we are told something and it is reinforced it becomes an accepted fact in our minds. We start to believe the crap other people say about us. Negativity begins to infect our thoughts. This is especially true for children who look to us adults. There is a big difference between preparing a child for the realities of the world and crushing their dreams. Naysayers be damned to the darkest corner of hell if you ever crush a child’s dreams. Doesn’t Life do this enough to us, do we really need to assist it. There will be time enough to crush the hopes and dreams of a person. Leave children alone. Let them believe. The magic of being a child is in believing anything is possible. Once we’ve taken that away, they are just sad adults in small bodies. A short man can’t play basketball- Muggsy Bogues might dispute you. He was only five foot three and he played in the NBA. If Muggsy listened to all you people out there that would say he couldn’t play basketball the NBA would have been deprived of one of its most exciting talents. If an immigrant wants to be President, it’s not that they can’t ever be President; it’s that they would have to overcome certain barriers, hurdles and obstacles before they did, which might include constitutional reform. It’s unlikely, but it could be done. The only place anything cannot be done is in your own mind and that is the best place for it to stay. All things are possible, they just have to be scaled by probability and a realistic dose of what is required in achieving ones goals. You know what anyone can amount to something if we don’t discourage them from doing so. It took me forty years to get over the damage inflicted by all those early naysayers and those who negatively impacted my life through their own inadequacies. It took me forty years to get over their opinions of me and to relegate their opinions to the scrapheap of worthless opinions. Negative people project their own inadequacies on others. Just because you couldn’t, or you can’t doesn’t mean someone else can’t, or would you have your children live your own failures. You know, I wish people would let children be children. What’s the hurry to make them grow up? Are we that unhappy in our own lives that we need someone to share our misery with? Do we take the high road, or the low road? When I write, I don’t do backstories, diaries, or character sketches that nobody will ever read. I don’t make notes either. I try not to divert myself from the task at hand, which is writing the story. I draft the story out from beginning to end in as complete a manner as I possibly can. In that first draft I actually attempt to write the story as it will appear, although edits will always change this. Almost all stories revolve around characters of some sort or another. If there are no characters, is there a story? Maybe, but I’m not going to get into that right now. So how do I develop these characters if I don’t use standard writing methods? I begin with a Name, or a handful of Names. That is where I start any story. From Names I build basic relationships and the events which unfold. Names are important and shouldn’t be given to Story Central Characters all willy-nilly. How much thought does a parent give to naming a child? So it should be for the author as he/she gives birth to a new character if the character helps drive plot and theme. I will provide an example from “The Scrolls of Sion: Rise of the Dark Queen.” The Sage, Adikavi, is perhaps the oldest inhabitant of Brynmor. I wanted to give him a name that was suited for such a being. Adikavi is a Sanskrit name meaning The First Poet. Immediately, I realized this to be a befitting name for the oldest of the Sages. “Scrolls” has Five Sages, each representing an Element and a Race, (Quintessence is an Element.) I made Adikavi Orcish in features, because the Orc live the longest lives in Brynmor and hence all prominent Orcs would receive Sanskrit names. The Orc Great Chieftain, Balesh’s name literally translates from Sanskrit to Master of an Army. Although it will not be picked up by the average reader, the names themselves contain pertinent information as to who the character is at his/her core. The name tells me how the character will behave and speak. The name gives me the back story of the character to some degree. The name is the foundation and cornerstone upon which I build. The rest of the character gets laid down brick by brick as the story progresses. The Release of “The Scrolls of Sion: Rise of the Dark Queen” is Here… Stop by this post to pick up your code for 40% off the list price. 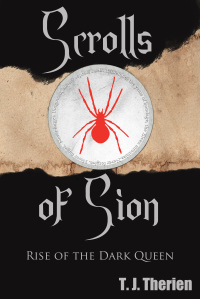 To celebrate my birthday and my Novel’s launch and to protest what Quebec politicians say I can’t do, I will be offering “The Scrolls of Sion: Rise of the Dark Queen” for 40% off the cover price for the first week. That’s right instead of the $4.99 list price; you can get “Scrolls” for $2.99 with the use of the code provided in the brackets. (MU39L) Offer valid May 25th 2014- June 1st 2014. Feel free to share this post. Get the word out. There’s a deal to be had. Don’t you realize, I’m worthy of your consideration?